Vroom! The crook is making a getaway in his powerful off-roader, but the police are in hot pursuit aboard their high-speed water plane. Splash! The crook deploys a raft from the bed of his vehicle and takes to the alligator-infested water. Take the controls of the awesome water plane, swoop low over the raft avoiding the snappy alligator, land on the water and apprehend the dumbstruck crook! Includes 2 minifigures with accessories: a police officer and a crook. Price is 52% above the initial Lego retail price! This comes down to 19.01 cent per brick. The Water Plane Chase (60070) Lego set is no longer directly available from the sites below. However, 3rd party partners of these sites might still have the set available. 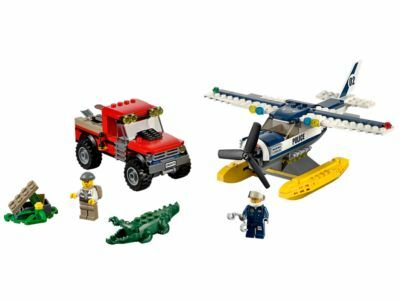 Alternate description Join the high-speed LEGO® City Water Plane Chase, with a police water plane, crook’s off-roader with raft, 2 minifigures and accessories.